I am almost 100 percent sure I want satin for the finish. I don't really want a super shiny surface. I want it to be closer to how wood looks naturally. I found some pictures online. 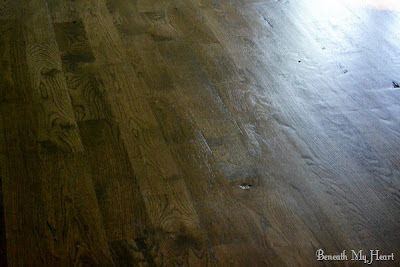 These are obviously different kinds of wood flooring and different color stain. I've read a lot about both products. Semi-gloss has a nice smooth feel, but shows any wear very easily. Satin is a lot better about hiding dents and dirt. That was the clencher for me. I am still hung up about which type to use- oil-based or water-based. Oil-based would make the color a little darker, a little more amber. And it would continue to darken some through the years. But the smell and fumes are horrendous. But it is much cheaper and dries very hard. Water-based is less toxic to smell and dries a lot quicker. You are supposed to be able to do all the coats fairly close together to get the job done faster. That does sounds appealing to me. But it is much more expensive. I think it is around $10 more for a gallon. When you are buying multiple cans that adds up. It dries very clear and does not change the color of the floors at all. I'm still unsure which to go with it. What do you guys think? Do you have an opinion or experience with either? I'd love to here it if you do. I can't seem to make up my mind. Here is a picture of a sample piece of wood that I put two coats of stain on and three coats of OIL-based polyurethane. What do you think and what would you choose? I don't know if you've decided on semi or satin or oil or water...but we've done a lot of wood finishing in our house (though not on the floors) and I thought I'd give you a few pros and cons, or at least support what you've already stated! 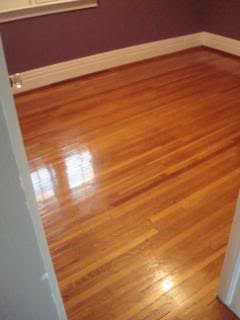 We used oil-based satin on most of our interior walls (half log walls). I love the satin, we used semi on the log hand rails b/c of lots of use and it seems so much more shiny and 'slippery' looking than I prefer. We used oil-based and I have to admit my husband was rendered useless during the finishing stage because the smell gave him such awful headaches (how convenient, huh?!). We did our finishing in the winter where it was hard to get good ventilation, so be warned! Our wood is pine as well and I would be interested to see what color my walls would be if I would have used water-based. Pine without taking poly into consideration already has a tendency to amber and I think my did even more because of the oil-based poly. If you like the color of your floors now-you might have already, but if I were to do it again, I'd probe around a bit more to see what pros think about how much the color is affected by oil or water poly. Anyway, I'm interested to see what you choose and am having fun watching your house transformation! Good luck, and hello from Hart! And thanks Ellen. I love any feedback anyone has with personal experience! I'd love to see your house some time. Sounds beautiful! We used oil-based stain and that was enough to get Scott and I feeling quite dizzy. But I think we can handle it for the most part. I'm definitely leaning towards oil. I like my color but I like the idea of it becoming a little more amber. They say water-based really preserves the color as it is.